With this board game students will practice speaking about familiar topics (house, family, favourites etc). 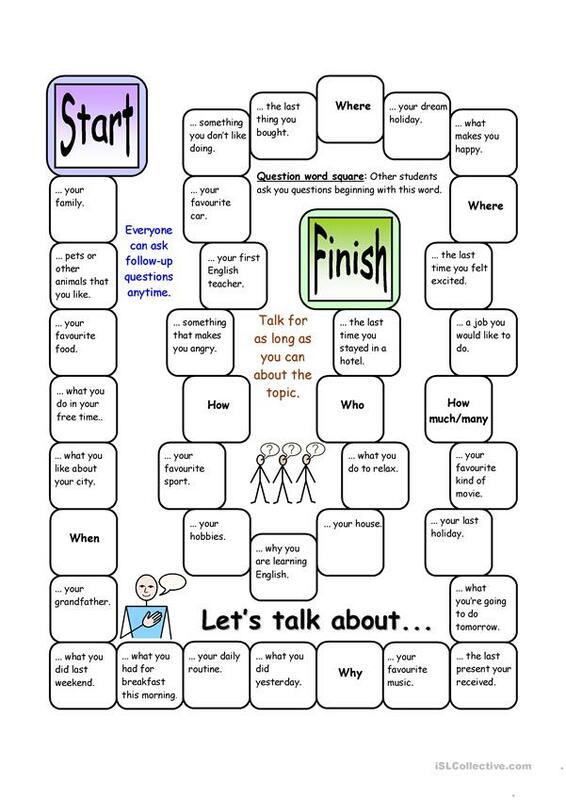 Although this board game was designed with lower-level learners in mind, it could be very useful for higher-level groups as well in order to consolidate vocabulary and improve fluency as most topics are vital for having a friendly chat with strangers. You could also set a minimum speaking time (say 30 seconds for Elementary students and 1 minute for Intermediate students) depending on your class. I also strongly suggest you encourage other students to ask follow-up questions in order to keep the conversation going. The present downloadable worksheet is meant for high school students and elementary school students at Elementary (A1) and Pre-intermediate (A2) level. It is valuable for revising Questions in English, and is excellent for strengthening your learners' Speaking skills.